While there is still some debate about the degree to which higher rates are impacting housing demand (see post), there is no question about the drop off in refinancing activity. The refinance applications index is down 60% from a year ago. 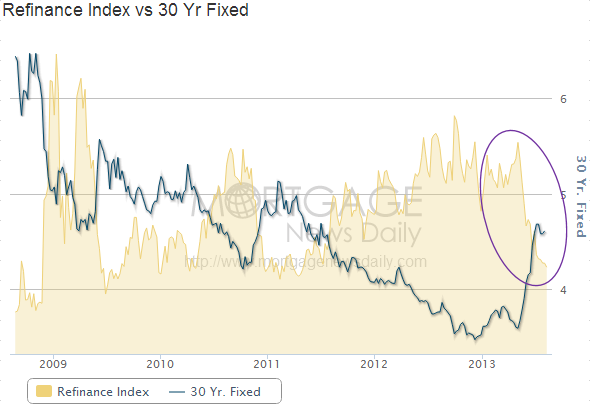 The (poorly designed) chart below from MND shows the refinance index and the 30y mortgage rates. Perhaps an even better indicator of refinance activity is the frequency of US Google search for the phrase "mortgage refinance" (chart below), which is consistent with the applications index. Google Trends US search for "mortgage refinance"
This slowdown is negatively impacting profitability in the banking sector and even generating layoffs. Moreover, economists are forecasting refinancing activity to shrink further in the next few quarters. The refi gravy train is coming to a stop. The Denver Post: - Higher interest rates are strangling the mortgage-refinancing market, eroding the industry's profits and forcing job cuts. "The refinancing volume has significantly dropped off," said Jim Hunter, president of the board of directors at the Colorado Mortgage Lenders Association. "It is putting pricing pressure into the market." Wells Fargo announced Aug. 7 that it would let go of 763 loan-processing workers nationally, including 118 in Colorado, because of the slowdown in mortgage activity. A day later, Chase Mortgage Banking said it would eliminate 150 positions in Colorado, effectively moving its mortgage-processing operations out of state. Refinances, which were 83 percent of all mortgage activity in mid-December, are down to 63 percent. Economists at the MBA estimate they could decline to a third of the total by the third quarter of 2014 . All of that means less business for lenders. Quarterly mortgage-origination volumes were running between $471 billion and $511 billion over the past four quarters. That volume could drop to $247 billion by the fourth quarter, the MBA forecasts.